This week, my PopMatters post is about Zelda. In this case, "Zelda" isn't shorthand for the franchise title "The Legend of Zelda." I'm talking about the Princess herself. I recently finished The Legend of Zelda: Spirit Tracks and was pleasantly surprised to find that Zelda was an active participant in the adventure. She usually spends the majority of the game imprisoned or in hiding, emerging only at the end to offer Link a tightly-scripted helping hand. 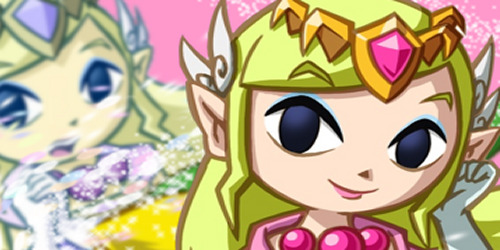 Spirit Tracks bucks this trend by pairing Link and Zelda at the beginning of the game and forcing the player to master both characters' unique skills. The Zelda series is regularly criticized for being stagnant. Some of this criticism is deserved: its overall format haven't changed much since the early 1990s and the games' specific plots are essentially interchangeable. However, in terms of specific design choices, they remain some of the most clever games out there. Every challenge builds on the last by forcing the player to learn new uses for old tools and apply some actual thought to discerning the puzzles' solutions. The Zelda games are about the player mirroring Link's transition from novice to master through developing skills rather than grinding for experience or groping around for a random solution. Still, it's all grown very familiar to veteran players. Link's bombs might have multiple distinct uses, but they're the same uses we discovered years ago. Spirit Tracks shakes up the routine by including Zelda as a playable character, one who has drastically different abilities with novel applications. This creates a familiar sense of growth over the course of the game while adding some welcome variety to Link's traditional arsenal. From a plot perspective, I love seeing Zelda and Link actually interact with each other. Zelda herself is usually a non-entity, and her relationship with Link is usually taken as a given. Spirit Tracks isn't a masterpiece, but it does manage to give Zelda a personality in its own quiet way. The combination of Zelda's amusing dialog and her ludic contributions in some of the dungeons reminds me of the dynamic between the Prince and Elika in 2008's Prince of Persia. Both games include princesses in danger, but neither is reduced to simply playing a damsel in distress. So, what is the future of Zelda as a character? The trailers for the forthcoming Skyward Sword don't inspire confidence, as they suggest she'll be returning to her role as a prize to be won at the end of the game rather than a meaningful character. This is a shame because Zelda's involvement in Spirit Tracks, modest though it may be, is a breath of fresh air in an often-stuffy series. Just played through most of Spirit Tracks myself, and I really strongly agree; she had more personality here than in most other Zelda games. The series seems to have been working really hard to shed the stigma of Navi by trying to add more interesting, helpful, and likeable sidekicks: Zelda in Spirit Tracks and Midna in Twilight Princess were both really great, and I personally have fond memories of Tatl. Agreed on the disappointed that Zelda will yet again be kidnapped in Skyward Sword. It's a waste of her brand new character design and new starting scenario as Link's childhood friend. Spirit Tracks is a great game, isn't it? I didn't get the chance to write about it, but the music is some of the best I've heard in a long time. I wonder if the handheld Zelda games are given more leeway in terms of experimenting with new things, both gameplay and story related? It makes me wonder what Twilight Princess could have been if the Nintendo devs had made Midna a playable character. I assume they would have had a lot of freedom to create unique abilities for her, seeing as she could command the twilight magic. I haven't played Spirit Tracks yet, but it's good to hear that it breaks the mold, and I will likely check it out after buying my 3DS. Good call re: Midna. I actually like Midna quite a bit and enjoyed the "twist" at the end. Maybe we'll get some more experimental console-based Zelda games once the WiiU is released? There's a lot of potential with that secondary screen!